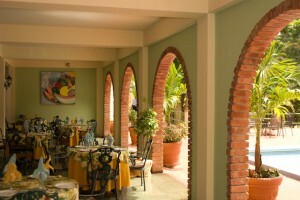 The Arches Restaurant, poolside at the Mandeville Hotel is one of the premier dining locations in Mandeville and central Jamaica. Known for its relaxing surroundings in the heart of Mandeville and the delicious meal options, diners choose the Arches Restaurant to celebrate special occasions and milestones. With its open-air veranda looking out on to the poolside and surrounding gardens, the Arches Restaurant is enveloped by the sights and sounds of nature. Offering excellent service to patrons, team members create memorable meal experiences. The varied a la carte menu offers Jamaican favorites and creations that reference both local and international flavours. From appetizing bisques to tempting desserts, there are dishes to suit a variety of palates. The Arches Restaurant is open to overnighting guests as well as those passing through. Breakfast, Lunch and Dinner are served at The Arches Restaurant each day. Opening Hours: 7:00 a.m. – 9:30 p.m. daily. Overnighting guests may opt for Room Service from The Arches Restaurant which is available at a service charge rate of 15%. Breakfast at The Mandeville Hotel is a special experience and on Sundays at the Mandeville Hotel our Buffet Breakfast is a special feature for diners and includes a wide array of selections. Laden with fresh fruit, ackee and codfish, mackerel rundown, escoveitched fish, callaloo, fried plantain, bammy, dumplings, and boiled green bananas, the Mandeville Hotel’s Sunday spread is a meal experience not to be missed.